Cannington is a village and civil parish 3 miles (5 km) north-west of Bridgwater in the Sedgemoor district of Somerset, England. It lies on the west bank of the River Parret, and contains the hamlet of Edstock. The parish formerly included part of the village of Combwich, with its port and ferry terminal. In 1881 the parish contained 4,980 acres (2,020 ha). The Saxon name of this village was Caninganmaersees or Cantuctone. Cantuc was an Old English word for a ridge, ton a settlement. The Battle of Cynwit took place in 878, and Cannington Camp, a Bronze Age and Iron Age hill fort, (also called Cynwir or Cynwit Castle) has been suggested as the most likely location for it. The Cannington Camp site, of recognized archaeological importance, has been partly destroyed by Castle Hill Quarry in its limestone quarrying activities. It was the site of a Benedictine nunnery, founded by Robert de Courcy about 1140, which survived until the Dissolution of the monasteries. The nunnery owned significant land in the area. The site is now Cannington Court which incorporates some remains of the Priory. The lords of the manor were the Clifford family including Hugh Clifford, 2nd Baron Clifford of Chudleigh. Gurney Manor, a 13th-century manor house with an attached chapel wing, had been converted into flats but is now supported by the Landmark Trust and is available as holiday accommodation. A manor house was also built at Blackmore Farm, with its own chapel, around 1480 for Thomas Tremayll. Cannington was part of the hundred of Cannington. The Cannington Centre for Land-based Studies was formerly known as Cannington College, which was established in 1921, but now forms part of Bridgwater College. The village is also home to Brymore Academy. The dairy in Cannington, which has been operating since the 1930s, is now owned by local firm Yeo Valley Organic and produces yoghurt. The village falls within the non-metropolitan district of Sedgemoor, which was formed on 1 April 1974 under the Local Government Act 1972, having previously been part of Bridgwater Rural District, which is responsible for local planning and building control, local roads, council housing, environmental health, markets and fairs, refuse collection and recycling, cemeteries and crematoria, leisure services, parks, and tourism. The village is part of 'Cannington and Wembdon' electoral ward. Although Cannington is the most populous area the ward does include Wembdon. The total population of the ward at the 2011 census was 4,507. It is also part of the Bridgwater and West Somerset county constituency represented in the House of Commons of the Parliament of the United Kingdom. It elects one Member of Parliament (MP) by the first past the post system of election, and part of the South West England constituency of the European Parliament which elects seven MEPs using the d'Hondt method of party-list proportional representation. The Church of St Mary has a tower which dates from the 14th century, the remainder was rebuilt in the early 15th century and restored in 1840 by Richard Carver. It was previously connected to Cannington Court and is postulated as the former church of a house of Benedictine Nuns. It has been designated by English Heritage as a Grade I listed building. The walled garden of Cannington. There is a golf course and open gardens. ^ a b "Cannington". British History Online. Retrieved 13 January 2008. ^ "History". Cannington Online. Archived from the original on 25 August 2007. Retrieved 13 January 2008. ^ "Somerset Historic Environment Record". Somerset Historic Environment Record. Retrieved 11 February 2010. ^ Havinden, Michael (1982). The Somerset Landscape. The making of the English landscape. London: Hodder and Stoughton. p. 130. ISBN 0-340-20116-9. ^ "Houses of Benedictine nuns: The priory of Cannington". British History Online. Retrieved 13 January 2008. ^ "Priory History". Cannington Online. Archived from the original on 20 July 2011. Retrieved 13 January 2008. ^ "Cannington Court". Images of England. Archived from the original on 18 October 2012. Retrieved 13 January 2008. ^ "The Manor". Images of England. Retrieved 13 January 2008. ^ "Landmark Trust — Gurney Manor". Retrieved 23 June 2010. ^ "Blackmore Farm Manor House". Images of England. Retrieved 13 January 2008. ^ "Cannington Hundred". British History Online. Retrieved 23 September 2011. ^ "Brdigwater RD". A vision of Britain Through Time. University of Portsmouth. Retrieved 4 January 2014. ^ "Cannington and Wembdon ward 2011". Retrieved 6 March 2015. ^ "Church of St Mary". Images of England. Retrieved 13 January 2008. 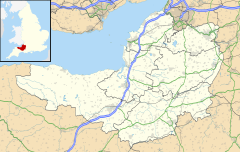 Wikimedia Commons has media related to Cannington, Somerset. This page was last edited on 26 March 2018, at 22:24 (UTC).